The ITSH warmly welcomes a new PhD researcher: Percy Leung. Percy started his PhD project on “Symphonic Beneficence. The Berlin Philharmonic Orchestra and the London Symphony Orchestra during the First World War” in January 2017, under the supervision of Professor Frank Müller. 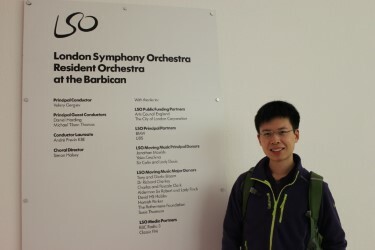 Percy is originally from Hong Kong, he has received a BA in Combined Honours in Arts (History, Music, Politics & International Relations) from Durham University and a M.Phil. in Music Studies from the University of Cambridge. “I am deeply passionate about the relationship between music and politics. My undergraduate dissertation explores the contradictions and paradoxes of the Nazis’ cultural policies, whereas my masters’ dissertation is essentially a comparative analysis on the Soviet Union’s and the United States’ cultural policies on music in post-war occupied Germany between 1945 and 1947. It focuses on these two Cold War superpowers’ efforts in reconstructing the German musical life after the collapse of the Third Reich, as well as on their Denazification policies on German musicians.” Read more on his project here.